“Legation Longhorn” began as a proposal to Marble Falls Sculpture on Main titled “Some Bull!”. He didn’t make their show, but has travelled to San Antonio and Jewett, TX outdoor shows. He sat on the grounds of the French Legation in Austin, TX for over two years. At that point I renamed him “Legation Longhorn”. 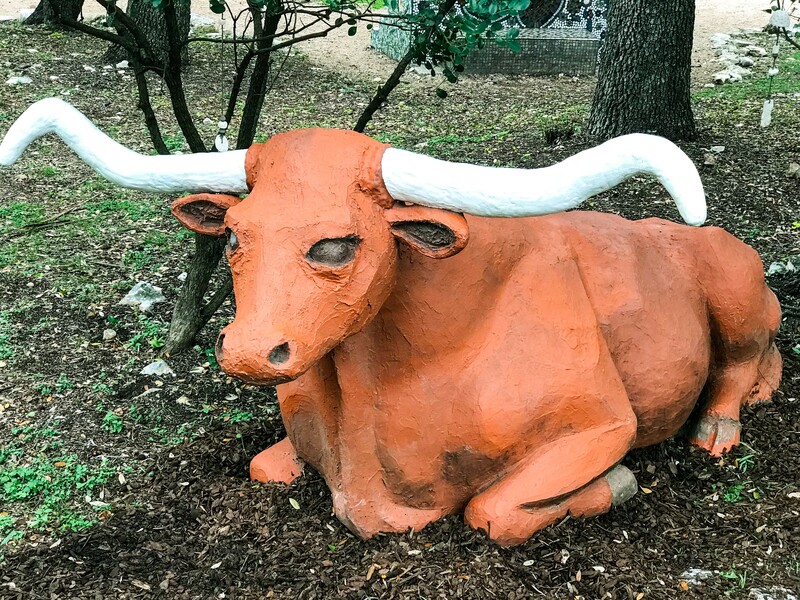 He moved to Round Rock’s Prete Plaza on Main Street prior to settling into his new home – Bee Cave Sculpture Park. He is my largest sculpture to date, and is mixed media over a styrofoam base. Marla Ripperda is a 5th generation Texan and Board Member Emerita of the Texas Society of Sculptors (T.S.O.S). She studied design and art history at the University of Texas and has participated in numerous art-related continuing education classes. In 2000 Marla moved from Austin to Lake Buchanan near Burnet, Texas to set up her studio in the beautiful Highland Lakes area. Marla considers herself a commissioned artist, meaning she prefers working with an individual client who has an idea, a place and a budget to create a unique and individual work of art. Whether sculpting, painting or teaching Marla tries to give back to the community a small part of the joy and fulfillment she finds in creating art.